On 9th April we made major changes to the Inside Government navigation bar by 1) exposing the sections rather than nesting them and 2) moving the search query field to the left. This was in response to user testing that suggested users were having difficulty finding some content, such as consultations which had been in a drop down under publications. With more departments being converged there was an increase of 78% of IG pages in the second period. 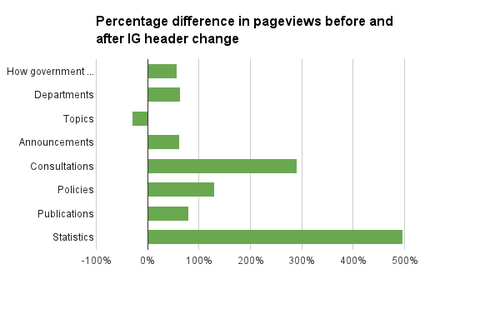 IG in total had an increase of 144% in pageviews, the pages being measured had a total increase of 66%. There is a great distribution in the percentage change of the pages featured in the header. The “Statistics” link has benefited the most with an almost 500% increase in pageviews. Views of the “Topics” page has actually decreased by 30% but there may have been other factors involved. It may have been that topics was being utilised by users who were trying to find their way to sections now exposed by the new nav. Because the new nav bar also meant a change in the position of the search query field and I asked my colleague, Tara, to look at the impact that had. Tara found that searches for publications and consultations dropped most visibly, suggesting that those nav links have made a difference. The exact terms ‘policy’ and ‘policies’ decreased slightly, but numbers were low so not very significant, whereas longer terms containing ‘policy’ or ‘policies’ increased by 22% and 24%. Some other terms also increased, but by less than the total Inside Government searches (about 25%), so really they all still dropped slightly. Only searches containing ‘statistic’ definitely increased, by 28%. Other good news is that changing the design of the search box has reduced the number of users clicking the search button without entering a search term. In summary, I think that this analysis points toward the changes to the nav being positively received by users. But we’ll keep an eye on it and keep tuning it as we go.